Mary set out and traveled to the hill country in haste to a town of Judah, where she entered the house of Zechariah and greeted Elizabeth. When Elizabeth heard Mary’s greeting, the infant leaped in her womb, and Elizabeth, filled with the Holy Spirit, cried out in a loud voice and said, “Blessed are you among women, and blessed is the fruit of your womb. And how does this happen to me, that the mother of my Lord should come to me? For at the moment the sound of your greeting reached my ears, the infant in my womb leaped for joy. Blessed are you who believed that what was spoken to you by the Lord would be fulfilled.” And Mary said: “My soul proclaims the greatness of the Lord; my spirit rejoices in God my Savior for he has looked with favor upon his lowly servant. From this day all generations will call me blessed: the Almighty has done great things for me, and holy is his Name. He has mercy on those who fear him in every generation. He has shown the strength of his arm, and has scattered the proud in their conceit. He has cast down the mighty from their thrones, and has lifted up the lowly. He has filled the hungry with good things, and the rich he has sent away empty. 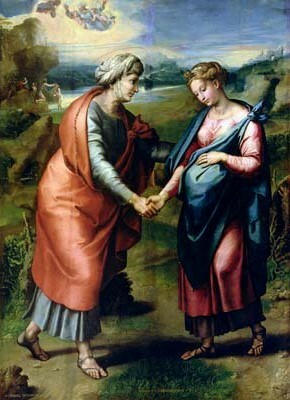 He has come to the help of his servant Israel for he has remembered his promise of mercy, the promise he made to our fathers, to Abraham and his children for ever.” Mary remained with her about three months and then returned to her home. The joy of this great encounter between Mary and Elizabeth is a direct result of the life growing inside each of them. Mary is carrying God incarnate in the silence and security of her womb. God could have entered the world in any other way, but he chose to do so through the most vulnerable among us, the unborn. God became the smallest of the small. In a culture where the value and dignity of the unborn is so often called into question, we need only remember that God Himself was once fragile and small as an unborn baby. This tells us of the tremendous worth that all human life holds at every stage of development. As from the moment of his conception Jesus was proclaimed to be the Son of God, so is every human life a creation of God the Father from the very first moments of their existence. CMF CURO was founded in an effort to promote a culture of life in health care. As today is the Day of Prayer for the Legal Protection of the Unborn, make time today to pray for the protection of the unborn and for the healing of all those effected by abortion. Ask for Mary’s intercession. Today your goal is to show respect to build health relationships within and outside of your family.